Tomorrow Corporation : Who are you, Tomorrow? Ever since our new game Little Inferno was announced last week, the response and questions and support have ignited a fire in our tummies and freshly energized us to finish this up! Interestingly though, we’ve noticed there is some confusion regarding who, exactly, is building Little Inferno. Is it 2DBOY, developers of World of Goo? EA? The San Francisco Fire Department? Tomorrow Corporation would like to state that it is, in fact, a brand new indie game developer, consisting of some of the same people, but not owned by or converted from any other company. The indie game scene is light and liquid like the movie industry, and new groups of friends come together to work on new single projects all the time. Tomorrow Corporation PR representatives would like to take this opportunity to directly address some very common misunderstandings! Is Little Inferno 2DBOY’s next game? 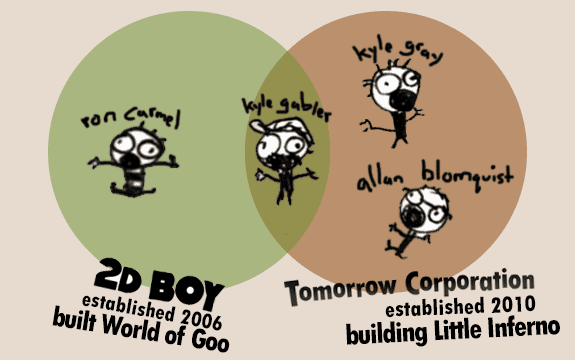 Nope, but Kyle Gabler of World of Goo / 2DBOY is now also working with Tomorrow Corporation. Indie game kids frequently work with multiple people. Did 2DBOY rename itself to Tomorrow Corporation? No. Although, confusion is understandable: Kyle Gabler is a co-founder of both 2DBOY and also Tomorrow Corporation. Allan Blomquist, another co-founder of Tomorrow Corporation, helped 2DBOY bring World of Goo to Wii back in 2008. 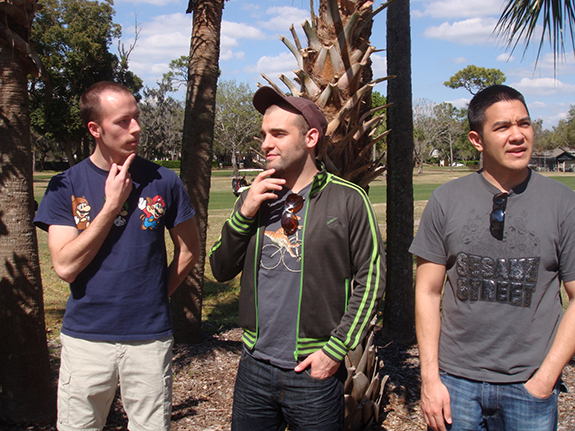 And Kyle Gray, the remaining co-founder of Tomorrow Corporation, is longtime friends with everyone at 2DBOY. Yes indeed! Ron Carmel and Kyle Gabler still run 2DBOY and have not ruled out a follow up, one day, to World of Goo. Ron and Kyle are now neighbors. Is EA making Little Inferno? Nope, although all three members have, at some point, also worked with EA. Tomorrow Corporation PR would also like to point out that EA would never make a game like Little Inferno because it “is not likely to ever actually make any money”. Didn’t all the Henry Hatsworth guys go make a company called Dreamrift? Kyle Gray led the Hatsworth team at EA. After they finished, all 7 team members went their separate ways: Ryan and Peter started Dreamrift, while Kyle Gray left for Tomorrow Corporation. Why does Little Inferno look like World of Goo? Is Little Inferno basically just World of Goo with flaming balls? Who exactly IS Tomorrow Corporation, then? Tomorrow Corporation is made of two Kyles and an Allan, who all met in grad school at Carnegie Mellon. 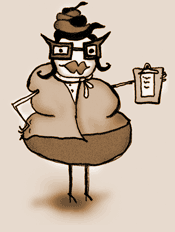 You can find handy bios and photos here! Wait wait, can you represent all of the above questions in Venn Diagram? Ok we hope that helps explain things a bit. Indie game kids sure are unwieldy! Yeah, even some dutch news-sites got it wrong. How stupid can they be? oh, (sorry for double posting 🙁 ) But what do you guy’s do for living if the game “is not likely to ever actually make any money”?? Well obviously, EA was very wrong! what the hell do you do in this game? other then burn things. The trailer makes me not want to play . I don’t understand what you do other then burn things or what your over all goal is. Venn diagrams are the best type of diagram there is! I wish there were games where you could make Venn diagrams. I’d play the absolute Venn outta that. Do you have na email for Press?